This is quite interesting as it shows that the demand for Bitcoin might be changing from one driven by individual speculation to one where institutional investors are gaining exposure to Bitcoin just as they do to other assets. It would seem to us that this is not exhausted. It might be the case that a lot more capital could enter the Bitcoin market in the years to come. One hurdle is the process of acquiring Bitcoin. There’s no easy vehicle to do that and institutional investors have to use tailor-made solutions with other financial institutions to enter the market. But this is not that different to what we had in gold and silver before the ETF era. And just as the launch of the GLD ETF gave access to the market to a broader spectrum of investors, any Bitcoin ETF or other Bitcoin-based vehicles might channel the institutional demand into the Bitcoin market. On BitStamp, we saw a move up but today’s action is quite different in that Bitcoin has gone down more visibly. (…) The main thing, apart from the price move, that suggests a bullish outcome is the move above the 78.6% Fibonacci retracement level based on the July rally. However, this move has not been confirmed just yet. This means that any bullish indications here are not yet present. 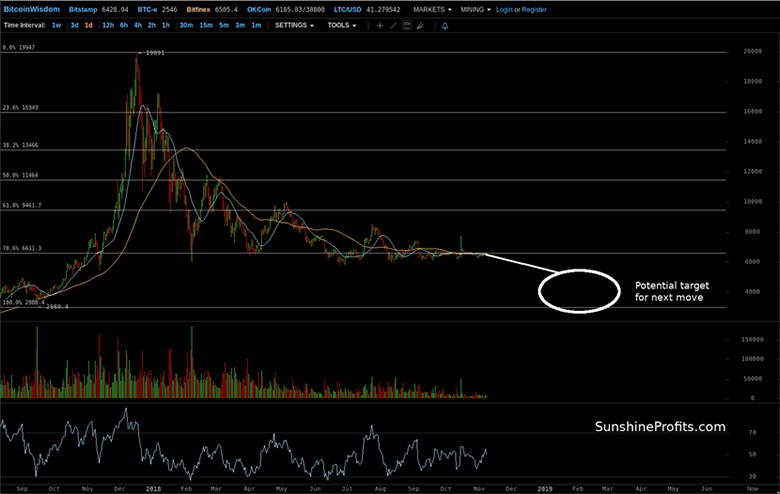 If we take a look at the volume, the move up hasn’t been confirmed by it either. This suggests that the appreciation we’re seeing now might not be anything more than just a counter-trend correction. Even if the 78.6% level is broken to the upside, this doesn’t have to have immediately strong bullish implications as the 61.8% level would be the point where Bitcoin could be stopped either way. The move above the 78.6% Fibonacci retracement is now confirmed, but this only has mildly bullish indications at this time. Actually, Bitcoin has been on the move down to this level. How the currency acts at this retracement is potentially more important. If we do see a breakdown back below this level, this could be the bearish trigger we’ve been waiting for. At the same time, a move up is not immediately strongly bullish as the 61.8% retracement is a level which could stop a potential move higher. 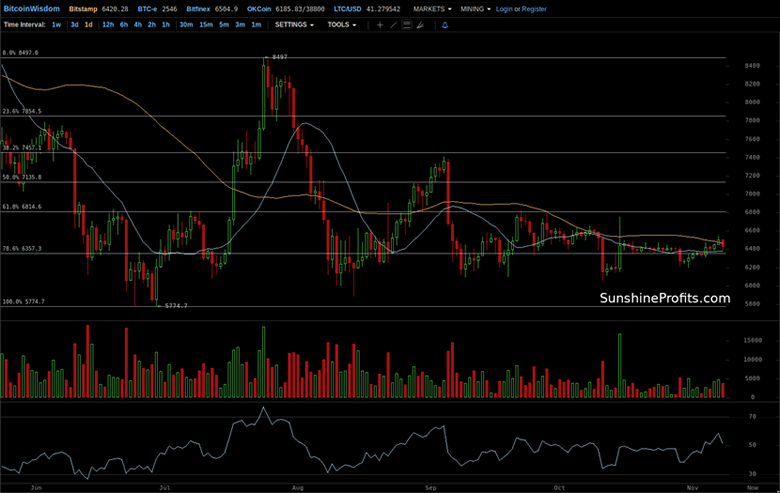 On the long-term Bitfinex chart, the price action is pretty much the same as we wrote in our last alert. The recent appreciation is still part of the dance around the 78.6% Fibonacci retracement level based on the move from around $3,000 to $20,000 – the all-time high. The 78.6% level is turning out to be the level to which Bitcoin is “glued.” This has been the case, with exceptions, since August. Particularly, since September we have seen limited volatility, with one exception. What this might mean is that trading in the proximity of the 78.6% retracement has now become the default mode. Any significant move away from this level might break this regime. Consequently, any visible move away from this level could herald the beginning of a new powerful action in the currency. With Bitcoin in a long-term downtrend and below the 78.6% retracement in a confirmed breakdown, the situation remain bearish. No real change here. The recent action still fits in quite well with the scenario in which Bitcoin stays glued to the 78.6% Fibonacci retracement… until it doesn’t. Any stronger move away from this level might provide a trigger for the next move. In the current environment, it seems that this trigger might be to the downside. Summing up, when Bitcoin deviates from the current sideways course, a more sizable decline might transpire.